JUBA (Reuters) - South Sudan's President Salva Kiir fired six ministers allied to his long-time rival Riek Machar late on Tuesday, widening a political rift in the world's newest nation and drawing threats of more fighting. 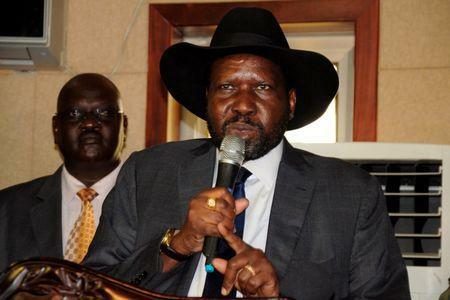 Kiir filled the vacant posts, including petroleum minister, with people linked to a breakaway faction of Machar's SPLM-IO party, further aggravating divisions between senior politicians in the oil producing nation. About 60,000 people have fled an outbreak of fighting between supporters of the two men in the past three weeks, the United Nations said, on top of the hundreds of thousands already forced to flee in two years of ethnically charged violence. U.N. emergency relief coordinator, Stephen O'Brien, told a news conference during a visit to Juba that the violence and "the culture of impunity" must stop before the humanitarian crisis worsened even further. The two years of civil war that erupted after Kiir sacked Machar as vice president in 2013 has killed more than 10,000 people and displaced more than 2 million, many of whom fled to neighboring Uganda, Ethiopia, Kenya and Sudan. The personal rivalry between Kiir, from the Dinka group, and Machar, a Nuer, has worsened ethnic splits in a country awash with weapons. Both sides agreed a peace deal last year and set up a unity government. But the ceasefire broke down several times and Machar left the capital last month, demanding an international force intervene to keep their forces apart. The chaos has dismayed regional and world powers who helped broker South Sudan's secession from Sudan in 2011, and had hoped its independence would draw a line under decades of war and instability that spread across east Africa. In Washington, U.S. State Department spokesman Mark Toner voiced dismay at the conflict and appeared to blame both sides. "The United States is deeply disappointed in the leadership of South Sudan, that given the opportunity of independence, and then frankly a second chance that came with the August 2015 peace agreement, have thus far failed to put aside personal power struggles for the good of their people," he told a daily briefing. Toner said the United States was putting pressure on both sides to end the violence. Kiir dismissed the ministers of the interior, petroleum, higher education, labor, water, as well as lands and housing in a statement read out on state television. The replacements were made on the recommendation of Vice President Taban Deng Gai, who announced he was taking over the SPLM-IO in July. "We are not surprised by the steps taken by ... Kiir and Taban Deng Gai," said Machar's deputy spokesman, Nyarji Jermlili Roman. He said Machar's supporters would march to Juba "and end this drama' if a foreign protection force demanded by Machar was not deployed.